Who is it for? Blue Heaven Walk Free Lipstick 15 is for all those who are looking for a budget lipstick with a shade suitable for every skin tone. It also provides moisturization to the lips and doesn’t let the lips to get all dried up. just open the lid and rotate the stick from the bottom in the right direction and glide on the lipstick over your lips evenly. Apply twice if needed. The shade is a little brown maroonish one. I’ve tried this lippie on both the type of skin tones and it looks perfectly fine on both of the complexions. The pigmentation is really good according to the price. The brand claims to provide nourishment as well as color to the lips. It has a non-matte formula and gives a glossy finish. The application was quite smooth. This lipstick is a perfect blend of color and gloss. It doesn’t stay for long hours and couldn’t survive meals or liquid. It really needs to be applied quite often as it gets easily wiped off. In summers even a little sweat removes the color from your lips. It has a very mild fragrance which is good for those who don’t like fragranced lip colors. It comes in a nice little black colored stick having walk free printed on it. The lid is tight and the lipstick is quite compact which makes it travel-friendly. I would definitely recommend this amazing product to all the college going girls out there, this really budget friendly lipstick is the best choice for lipstick lovers. This shade is perfect for all kind of skin tones. This lipstick provides a glossy finish and moisturizes the lips well. Nicely pigmented lip color is all we love. 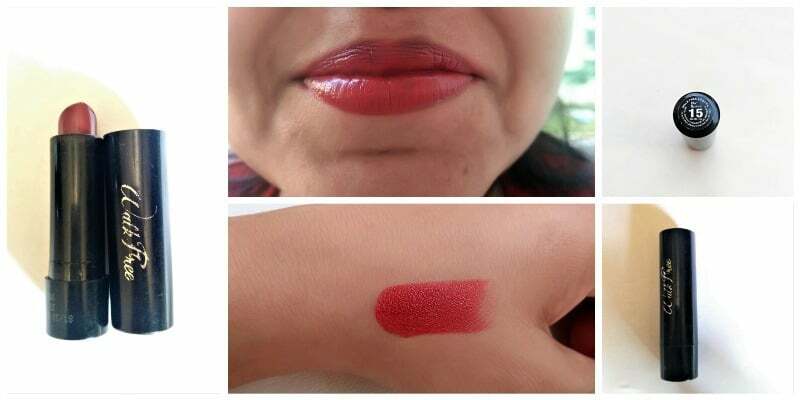 Give this lipstick one chance and you won’t regret buying this one. Love how this lipstick is affordable as well as amazing!